On Sunday, March 17, HaTikva Families hosted a group of 15 volunteers to assemble and package over 70 mishloach manot for children, youth, house parents, and emergency shelter families in Orr Shalom homes throughout Jerusalem and central Israel. 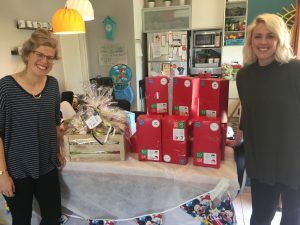 Each gift received a hand-written note of encouragement, contained high quality and organic items ranging from sweet treats and pantry items to games and personal care products, and was covered in prayer before it was loaded up for delivery. Tuesday, March 19, was our official delivery day, and we can say with all confidence that it was the highlight of our Purim season. With loaded vehicles, our team drove from house to house and the joy in which we were received was contagious. Many of the families were preparing special parties to welcome the children home from an early dismissal from school, and the house parents and staff excitedly added our gifts, front and center, to greet the children as they walked in the door. The care-givers of each home were not only floored by the generosity poured out on their kids but were deeply touched by the thoughtfulness and quality of the baskets made just for them. They warmly shared about the home and were genuinely interested in how HaTikva Families is supporting adoption and fostering in Israel. After expressing our desire to stay connected with them, we parted ways with an open invitation to pop by our offices and share a cup of coffee. Meeting these families and sharing their joy this Purim was a priceless gift. We are grateful to be a part of this work that the Lord is doing through HaTikva Families and are forever thankful for the love, support, donations, and prayers that made the vision for Purim Gifts 2019 a reality.